I have been having some weird dreams the last couple of days. I feel like someone or something is try to get a messages to me. It feels like I am suppose to do something. I have the need to just “GO” some where. I had the impression my deceased husband was hurrying me out of some where and I didn’t want to go. I would wake up with my back killing me. After I was awake for awhile I was fine. So I decided to a simple Tarot reading which is where I center myself quite my mind, shuffle the deck and when I feel the time is right I pull a card from the deck and that is my answer I am looking for. I just need to now meditate on that card to let Spirit talk to me. Well the card I pulled was the Ace of Wands. I have put that cards meaning on my F/B page (Whisper of Change) but I will also put what is on this page here so you can see it also. 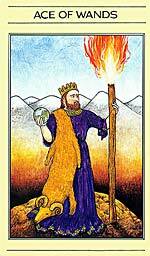 In the Mythic Tarot, we see King Zeus holding the world in one hand and a flaming staff in the other. He stands before snow-capped mountains, the sacrificial ram’s Golden Fleece draped over one arm. This card represents the beginning of the Jason and the Argonauts story, before Jason is sent on his quest to retrieve the fleece so that he could claim his rightful role as King. Zeus was at the heart of the Golden Fleece myth, as he’s sent its owner (a winged golden ram) down from the Heavens in an earlier tale. He “wears” the sacrificial ram in this depiction, symbols of owner-ship and protection. The images on this card represent the powerful union of creative vision and dynamic potential. This is the message behind this card: you may very well have to give something up — but that “something” is probably far less precious than the sense of achievement you acquire when you finally reached your goals. In the Golden Tarot, this card shows an angel kneeling in front of a wall of flame. She holds a lily in one hand and a newly sprouted branch (wand) in the other, an open book on the ground before her. The emphasis here is on warmth, growth, spirit and purity. It’s a card of feminine strength and power. The symbols of faith and grace are very important aspects of this card: if we align ourselves with the greater good, we don’t need to fight aggressively for what we want — it comes to us gratefully and easily. Cancer: Owning land, buying or building a home, taking care of loved ones, having (or working with) children, adopting or fostering a child, working with families in crisis; researching your family history, writing your memoirs, flipping houses, building a nest egg, taking a cruise, traveling via motor-home. Capricorn: Starting a business, building a brand, delegating responsibility; studying history, architecture, archaeology, paleontology, physics; appraising property and antiques; working in construction and development, management or authority positions, as college professor, working with the elderly; dentistry, chiropractic. Pisces: spiritual pursuits, volunteer work; working with those less fortunate; pharmaceuticals, drug testing, bartending; drug counseling; film-making; music, photography, poetry; meditation; psychic pursuits; animation, dream analysis; forgiving yourself and others; learning unconditional love; practicing random acts of kindness. After meditating on it for awhile it came to me. I am doing exactly what I saw in my dream. I am being pulled along by my Spirit Family to do the work I am passionate about. But for reasons that are not as clear to me yet, I am being told to hurry it up. I have been showing signs of resistance (not to much) but enough that they are trying to get my attention. In my dream, I am just pulling back a little, digging my heels in and wanting to know why. It is not that who ever is pulling me doesn’t want to tell me, its just that I will find out when I get there. I am not scared or not wanting to go, it is just that I want answers and I want them now. I am being stubborn and resisting until I get what I want first. Boy is that just like me sometimes. Those of you that know me know what I am an what I want to do with my life….Be a life Coach. You also know that I have lost both my husband (in 2000) and my youngest daughter (in 2007). You know that I have been struggling with grief and that I am also very spiritual and have been a gifted psychic for many years. My goals in life have always been to help others. Sometimes I am asked for help and sometimes I just put my 2 cents in before I am asked. Either way I am the person that people always come to for help. I seem to draw those that are sincere as well as those that are not. My lesson in life has been to know how to establish boundaries and know when to help and when to back away so as not to get used. I am learning that now. With the help of Maia Berens and her You University I have found the tools I need to do just that. I now can be who I was meant to be. This is what my dream was telling me. To hurry and do the work. I have been dragging my feet to long. I have work to do and people need me. So there will be no more resistance and I will follow my passion and dreams. I will not stop until it is done and I become the person I was meant to be.